Ember Inns pub near the station in Walton. On a day where I struggled to find any real cider, this did at least have a mulled cider - Orchard Pig Juggler. The bar manager insisted on putting it in the microwaved. It was a cold night. So I didn't moan too much. Ales were Sharp's Doom Bar, Fuller's London Pride, Shepherd Neame No. 18 Yard Rudolph's Reward, Reunion Opening Gambit, Hogs Back TEA, Timothy Taylor Landlord & Black Sheep Ember Pale Ale. Plenty of people were dining and I recall a live Arsenal match on the televisions. One of the better pubs on this night. Large pub and restaurant right opposite Walton on Thames station. I have been here both of the times I have been to watch a football match at Walton & Hersham FC. I've never eaten here so I cannot comment on the food, but the beer selection was fine. Both visits there was 3 good ales on draught, on my last visit I had 2 very good pints of St Peter's, Mild. Good clean interior, outside seating area to the front as you enter and the dining area is to the rear of the pub. 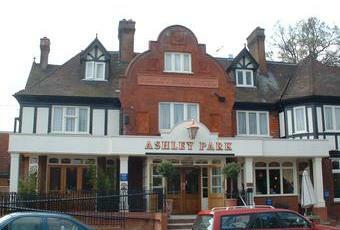 The Ashley Park has just started a Monday Night Ale Club. Visited the first night-several real ales including excellent Doom Bar,London Pride and Timothy Taylors all at �2.50 a pint-I can easily pay �3.50 for the same brew not very far away from Walton-well done shley Park-keep up the good eork! Civilised place to eat and drink. No children under 14 allowed, so good adult atmosphere. Excellent selection of cask ales and lagers. Food is good quality and good value. Staff friendly. Facilities: Fruit Machines: 3. Quiz machine. No jukebox - background music. Partly air conditioned. 3 gas log effect fires. Linked to a Travelodge. Bad points - Have had cold food served up but no fuss or problem retuning it. Too brightly lit makes it seem slightly sterile. Agree with other reviews which say lights should be dimmer. Overall - would give 8 / 10 marks.